New Year's Day 2014 will have special significance as Connect Charter School officially replaces Calgary Science School as the name of our school. This will be the third time the name of the school has been changed and the name change reflects its ongoing evolution. Originally when the charter school received approval in 1999, through an application by the Science Alberta Foundation, the school was known as the Science Alberta School. The belief by the founding members was that there was a need for a charter school which fostered cross-curricular learning with an emphasis on the scientific method, research, inquiry and the enhancement of learning and teaching through the use of technology. 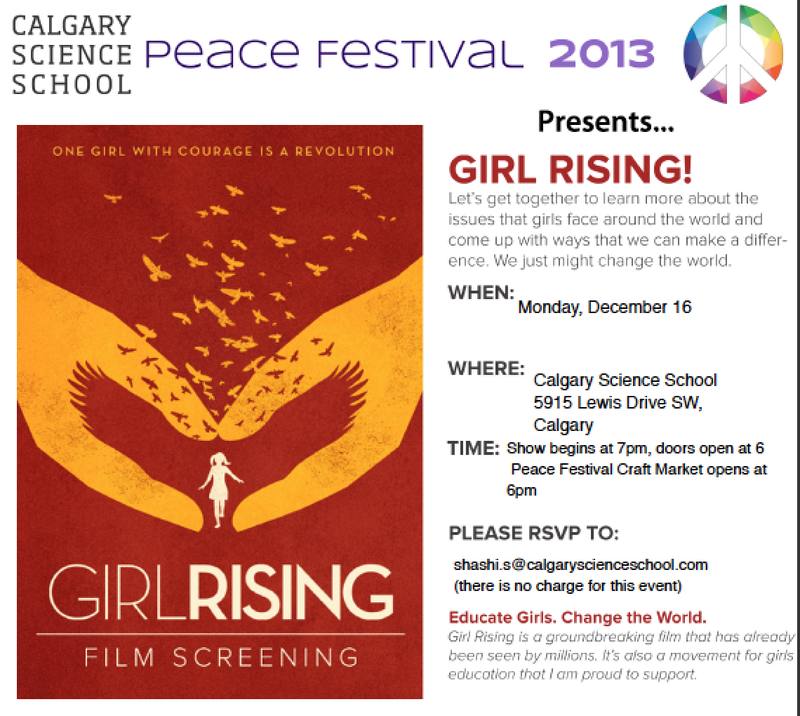 On December 16th, Calgary Science School is please to host a screening of the film Girl Rising. Girl Rising is a groundbreaking feature film about the strength of the human spirit and the power of education to transform societies. The film presents the remarkable stories of nine girls around the world, told by celebrated writers and voiced by renowned actors. Girl Rising is a grassroots global action campaign for girls’ education, powered by girls, women, boys and men around the world who stand for equality. Millions have seen the film and are spreading its message across campuses and communities of all kinds - raising both awareness and funds. Girl Rising partners with established nonprofit organizations that drive donations to programs that help girls get in school and stay in school. After the film there will be a Q&A/Panel Discussion with Donna Kennedy-Glans (MLA for Calgary Varsity, Founder of Bridges Social Development, first female VP of Nexen, advocates for female eduction in Arab and African countries), Shirley Steinberg (Chair and Director, The Werklund Foundation Centre for Youth Leadership Education, Professor, Youth Studies) Karen Cuthbertson (founder of HANDS: Helping Across Nepal Development Society) and Calgary Science School students. 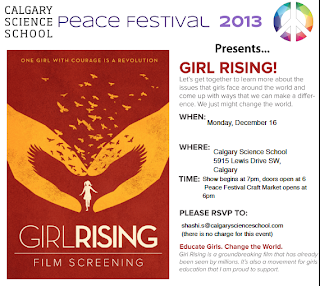 The screening will take place on December 16th at 7pm at the Calgary Science School. Along with the screening there will be a Craft Market with proceeds going to the Calgary Drop-In Centre and Alberta Animal Rescue Crew Society. Doors open at 6pm. In July 2013, I had the privilege to work with students, teachers, Galileo Network experts and researchers at the University of Calgary. (Brent Davis – Professor and chair of mathematics education, Krista Francis Poscente – IOSTEM Director). We met in May to discuss the research portion of the spatial reasoning project. In that one day in May I discovered the importance of spatial reasoning as I went through my own testing and problem solving activities. I learned very quickly that this is a skill that needs to be taught and explored throughout our education. We cannot assume that everyone will be in an environment that allows for this particular skill to be enhanced. I am a believer in providing students with every opportunity to reach for goals that may potentially transpire into future careers. In discussion with the researchers and their knowledge, it was apparent that the careers people choose are based in part by what their spatial reasoning capabilities are. We are thrilled to be announcing the first annual Innovate West conference to be held at Connect Charter School, May 23-25, 2014. This conference will be a gathering of forward thinking educators in western Canada and will be an opportunity to share, collaborate and reflect. We are looking forward to reconnecting and learning with our own professional learning network which consists of many schools and school boards in Alberta and British Columbia with whom we have worked with over the past decade. If you have attended ConnectED Canada here in 2012 or 2013, the format will be familiar. Friday is an instructional day where conference attendees have the opportunity to visit classrooms and talk to students and teachers about their learning. Tour guides consist of grade 4 to 9 students who have a lot to say and will tell you all about learning in an inquiry setting and what that means to them.